Many philosophers today concede that Greek philosophy has influenced much of Western thought since its inception. Alfred North Whitehead once noted: "The safest general characterization of the European philosophical tradition is that it consists of a series of footnotes to Plato." Clear, unbroken lines of influence lead from ancient Greek and Hellenistic philosophers to Early Islamic philosophy, the European Renaissance and the Age of Enlightenment. The convention of terming those philosophers who were active prior to Socrates the pre-Socratics gained currency with the 1903 publication of Hermann Diels' Fragmente der Vorsokratiker, although the term did not originate with him. The term is considered philosophically useful because what came to be known as the "Athenian school" (composed of Socrates, Plato, and Aristotle) signaled a profound shift in the subject matter and methods of philosophy; Friedrich Nietzsche's thesis that this shift began with Plato rather than with Socrates (hence his nomenclature of "pre-Platonic philosophy") has not prevented the predominance of the "pre-Socratic" distinction. Thales of Miletus, regarded by Aristotle as the first philosopher, held that all things arise from water. It is not because he gave a cosmogony that John Burnet calls him the "first man of science," but because he gave a naturalistic explanation of the cosmos and supported it with reasons. According to tradition, Thales was able to predict an eclipse (see Eclipse of Thales) and taught the Egyptians how to measure the height of the pyramids. Thales inspired the Milesian school of philosophy and was followed by Anaximander, who argued that the substratum or arche could not be water or any of the classical elements but was instead something "unlimited" or "indefinite" (in Greek, the apeiron). He began from the observation that the world seems to consist of opposites (e.g., hot and cold), yet a thing can become its opposite (e.g., a hot thing cold). Therefore, they cannot truly be opposites but rather must both be manifestations of some underlying unity that is neither. This underlying unity (substratum, arche) could not be any of the classical elements, since they were one extreme or another. For example, water is wet, the opposite of dry, while fire is dry, the opposite of wet. Anaximenes in turn held that the arche was air, although John Burnet argues that by this he meant that it was a transparent mist, the aether. Despite their varied answers, the Milesian school was searching for a natural substance that would remain unchanged despite appearing in different forms, and thus represents one of the first scientific attempts to answer the question that would lead to the development of modern atomic theory; "the Milesians," says Burnet, "asked for the φύσις of all things." Pythagoras is said to have been a disciple of Anaximander and to have imbibed the cosmological concerns of the Ionians, including the idea that the cosmos is constructed of spheres, the importance of the infinite, and that air or aether is the arche of everything. Pythagoreanism also incorporated ascetic ideals, emphasizing purgation, metempsychosis, and consequently a respect for all animal life; much was made of the correspondence between mathematics and the cosmos in a musical harmony. 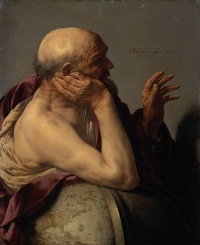 Heraclitus must have lived after Xenophanes and Pythagoras, as he condemns them along with Homer as proving that much learning cannot teach a man to think; since Parmenides refers to him in the past tense, this would place him in the 5th century BCE. Contrary to the Milesian school, who would have one stable element at the root of all, Heraclitus taught that "everything flows" or "everything is in flux," the closest element to this flux being fire; he also extended the teaching that seeming opposites in fact are manifestations of a common substrate to good and evil itself. Sophistry arose from the juxtaposition of physis (nature) and nomos (law). John Burnet posits its origin in the scientific progress of the previous centuries which suggested that Being was radically different from what was experienced by the senses and, if comprehensible at all, was not comprehensible in terms of order; the world in which men lived, on the other hand, was one of law and order, albeit of humankind's own making. At the same time, nature was constant, while what was by law differed from one place to another and could be changed. Socrates, born in Athens in the 5th century BCE, marks a watershed in ancient Greek philosophy. Athens was a center of learning, with sophists and philosophers traveling from across Greece to teach rhetoric, astronomy, cosmology, geometry, and the like. The great statesman Pericles was closely associated with this new learning and a friend of Anaxagoras, however, and his political opponents struck at him by taking advantage of a conservative reaction against the philosophers; it became a crime to investigate the things above the heavens or below the earth, subjects considered impious. Anaxagoras is said to have been charged and to have fled into exile when Socrates was about twenty years of age. There is a story that Protagoras, too, was forced to flee and that the Athenians burned his books. Socrates, however, is the only subject recorded as charged under this law, convicted, and sentenced to death in 399 BCE (see Trial of Socrates). In the version of his defense speech presented by Plato, he claims that it is the envy he arouses on account of his being a philosopher that will convict him. The fact that many conversations involving Socrates (as recounted by Plato and Xenophon) end without having reached a firm conclusion, or aporetically, Socrates is said to have pursued this probing question-and-answer style of examination on a number of topics, usually attempting to arrive at a defensible and attractive definition of a virtue. Numerous subsequent philosophical movements were inspired by Socrates or his younger associates. Plato casts Socrates as the main interlocutor in his dialogues, deriving from them the basis of Platonism (and by extension, Neoplatonism). 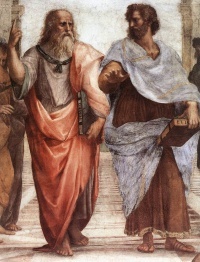 Plato's student Aristotle in turn criticized and built upon the doctrines he ascribed to Socrates and Plato, forming the foundation of Aristotelianism. Antisthenes founded the school that would come to be known as Cynicism and accused Plato of distorting Socrates' teachings. Zeno of Citium in turn adapted the ethics of Cynicism to articulate Stoicism. Epicurus studied with Platonic and Stoic teachers before renouncing all previous philosophers (including Democritus, on whose atomism the Epicurean philosophy relies). The philosophic movements that were to dominate the intellectual life of the Roman empire were thus born in this febrile period following Socrates' activity, and either directly or indirectly influenced by him. They were also absorbed by the expanding Muslim world in the 7th through 10th centuries CE, from which they returned to the West as foundations of Medieval philosophy and the Renaissance, as discussed below. Aristotle moved to Athens from his native Stageira in 367 BCE and began to study philosophy (perhaps even rhetoric, under Isocrates), eventually enrolling at Plato's Academy. He left Athens approximately twenty years later to study botany and zoology, became a tutor of Alexander the Great, and ultimately returned to Athens a decade later to establish his own school: the Lyceum. At least twenty-nine of his treatises have survived, known as the corpus Aristotelicum, and address a variety of subjects including logic, physics, optics, metaphysics, ethics, rhetoric, politics, poetry, botany, and zoology. During the Middle Ages, Greek ideas were largely forgotten in Western Europe (where, between the fall of Rome and the East-West Schism, literacy in Greek had declined sharply). Not long after the first major expansion of Islam, however, the Abbasid caliphs authorized the gathering of Greek manuscripts and hired translators to increase their prestige. Islamic philosophers such as Al-Kindi (Alkindus), Al-Farabi (Alpharabius), Ibn Sina (Avicenna) and Ibn Rushd (Averroes) reinterpreted these works, and during the High Middle Ages Greek philosophy re-entered the West through translations from Arabic to Latin. The re-introduction of these philosophies, accompanied by the new Arabic commentaries, had a great influence on Medieval philosophers such as Thomas Aquinas. Unless indicated otherwise, the text in this article is either based on Wikipedia article "Ancient Greek philosophy" or another language Wikipedia page thereof used under the terms of the GNU Free Documentation License; or on original research by Jahsonic and friends. See Art and Popular Culture's copyright notice. This page was last modified 14:16, 29 October 2014.